Home » News » Well That Was A Close Shave! But What’s The Future Of The Sleeping Shaman? Post Surgery – well that was one hell of a close shave! I don’t normally use this here website to talk about personal things as its always been about the music! However in this instance I think its time to let people know whats happening as it’s going to affect the future of The Sleeping Shaman, which has had a loyal following since its inception back in 2005. As you’ve probably noticed the site has had sporadic updates over the last year or so. I had a divorce to deal with, which I won’t lie, mentally drained me and even when it was done and dusted I still couldn’t relax as I had an underlying health issue gnawing away. 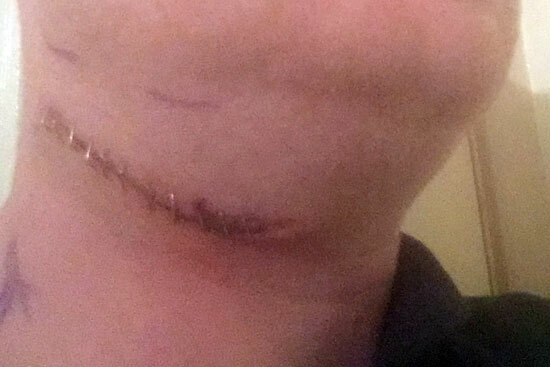 I’d found a lump in my neck around a year ago that was getting bigger not smaller, being a typical bloke though I tried to put on a brave face and ignore it, with the hope it would go away while I was dealing with all the legal shite a divorce throws at you, but as we all know, that never happens! Roll on a few week ago, and not long after having an amazing few days at this years Roadburn Festival and working on Weirdo Canyon Dispatch, I was brought back down to earth with a bang as while having a meeting at work, my boss clocked the lump, stopped the meeting there and then and ordered me to go to the doctors. I managed to get an emergency appointment, who then quickly referred me to the hospital and it was time to face up to reality. A few days later I had my first appointment with the consultant where they stuck a camera up my nose and down my throat (a very weird feeling! ), did a needle biopsy, and said they need to carry out an MR Scan (man are they freaky, like being at an ultra intense & claustrophobic Merzbow gig!) and CT Scan. I don’t need to spell out what they were testing for, but between that appointment, having the scans and getting the results it was a very worrying time. 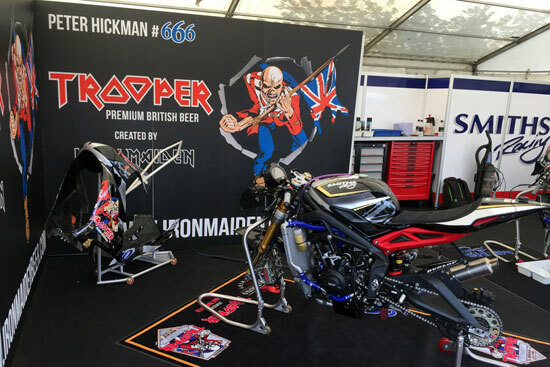 I had a trip to the Isle of Man TT planned between seeing the consultant and getting the results, I said I’d cancel, but they told me to go and enjoy, but it was a struggle, even when drooling over Peter Hickman’s Trooper Beer Triumph which he rode to an impressive 3rd place in the Supersport race, a black cloud was looming over me. Results day was now upon me, I remember being sat in the waiting area and I couldn’t settle or keep still. I was then called into the consultants room, he greeted me with a smile and the first words out of his mouth were ‘It’s Good News‘, as although its confirmed a tumour in the saliva gland, the tests showed its benign, I could have hugged and kissed him there and then! He did add that urgent surgery was needed, due to the size, how long it had been there and that it could potentially turn but I’m not to worry as its been caught in time. The best results, all things considering, I could have hoped for. True to their words, they got me in for surgery quick, which was Wednesday just gone (Summer Solstice of all days). Everything went well, they managed to remove all the tumour, although as you can see in the photo I have a hell of a battle wound, which must be around 7-8cm as the tumour was quite a size. Overall though, I’m doing OK, I’ve got a little bit of discomfort after being initially dosed up with morphine, but feeling positive. Next week I get the staples removed then the following week, I get the results from the second biopsy, so all being well, I won’t need any post-op treatment, but we’ll wait and see. So what exactly does this mean for The Sleeping Shaman? Well that’s a good question as some serious life style changes need to be made after a health scare like this and I know over the coming weeks/months, I won’t be able to put anywhere near as much time into it as I have been able to previously. When I got the news, I did send out an email to those who write for the site to see if any of them could step up and help. I did get a couple of offers which I’m grateful for and I also realise that peoples lives change, they move on and can’t commit like they once could. Overall though, I’m sad to say that for a community that prides itself on coming together in times of need, this wasn’t the case for me as only a handful of people got in touch to either offer help or support, quite disappointing really. So before I sign off, this is a ‘Call To Arms‘ to see if there’s anyone out there that could help keep The Sleeping Shaman alive. Although it wasn’t the first webzine of this kind to surface, its been around for a long time and I hope, built up a lot of respect within the underground. So if anyone can offer help in any way, shape or form, please do get in touch, whether it’s just as a writer, a more hands on role like sub editor, helping with social media, or any thing else, please drop me a line via the Contact Form, which is now working again! Please however bear with me replying for obvious reasons. Sorry, this post went on longer than planned, but thanks for taking the time to read it, and I haven’t wrote this to get the ‘sympathy vote’ as I’ve found it quite therapeutic just getting things off my chest after the roller coaster ride I’ve been through. I’d also like to take this opportunity to say a huge thank you to my family, a few very close friends who knew what was happening and my work colleagues for the awesome support, as well as our beloved NHS and the incredible staff at Salford Royal Hospital, I can’t fault them. 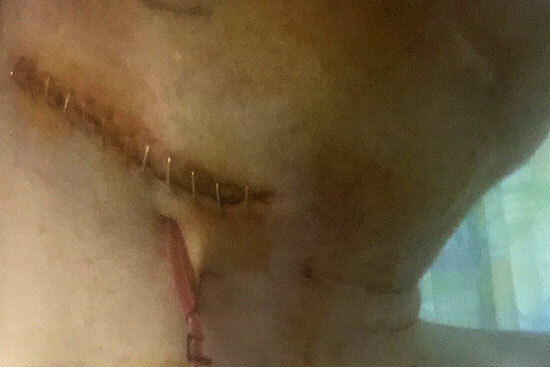 And I’ll leave you with a track from the classic power violence band Stapled Shut which I think is very apt considering my neck is currently being held together by about a dozen staples!